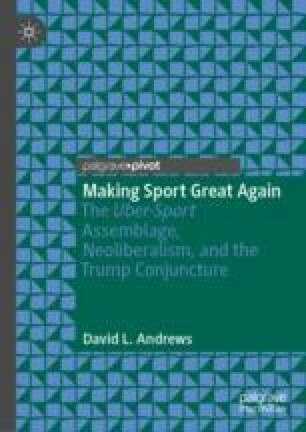 This chapter illustrates how the uber-sport assemblage is complexly interrelated with both the neoliberal and Trump assemblages, and so contributes to the instantiation of Trumpism. The Trump/Trumpism assemblages are examined as expressions of a conjunctural authoritarian populism, followed by an elaboration of uber-sport’s articulation to the conspicuously neoliberal elements of Trumpism, specifically those related to meritocracy, competitive individualism, and post-racial politics. This leads to an overview of the Trump assemblage’s divisive racial and national politicizing of uber-sport, as manifest in criticism of, and outrage directed toward, aspects of the uber-sport assemblage, specifically athlete activists such as Colin Kaepernick and LeBron James. The chapter concludes with resistive and corroborative responses to Trumpism’s politicization of uber-sport exhibited within the traditional media, social media, and related organizations. Armour, N. (2018, October 10). NFL doing just fine in ratings game. USA Today, pp. 2C–3C. Retrieved from https://www.usatoday.com/story/sports/columnist/nancy-armour/2018/10/09/no-need-president-trump-worry-nfl-tv-ratings-doing-just-fine/1577261002/. Borchers, C. (2018, February 4). How the blue-state New England Patriots became an avatar for Trump. Retrieved from https://www.washingtonpost.com/news/the-fix/wp/2018/02/04/how-the-blue-state-new-england-patriots-became-an-avatar-for-trump/?utm_term=.e7d07da22ac6. Brice, J., & Andrews, D. L. (2019). SheBelieves, but does she? Complicating white women’s understandings of the postfeminist-neoliberal empowerment discourse. Leisure Sciences. https://doi.org/10.1080/01490400.2018.1539680. Chow, K. (2016). “Politically Correct”: The phrase has gone from wisdom to weapon. NPR: Code swith-race and identity, remixed. Retrieved from https://www.npr.org/sections/codeswitch/2016/12/14/505324427/politically-correct-the-phrase-has-gone-from-wisdom-to-weapon. CNN. (2018, July 30). CNN Tonight: LeBron James’ journey from childhood to NBA; Racism in the Free World (Transcript). Retrieved from http://transcripts.cnn.com/TRANSCRIPTS/1807/30/cnnt.01.html. Dubin, J. (2016). Colin Kaepernick: I’ll keep sitting for anthem until meaningful change occurs. CBSSports.com. Retrieved from https://www.cbssports.com/nfl/news/colin-kaepernick-ill-keep-sitting-for-anthem-until-meaningful-change-occurs/. Dubrow, J. K., & Adams, J. (2012). Hoop inequalities: Race, class and family structure background and the odds of playing in the National Basketball Association. International Review for the Sociology of Sport, 47(1), 43–59. http://irs.sagepub.com/cgi/content/abstract/47/1/43. Falcous, M., Hawzen, M. G., & Newman, J. I. (2018). Hyperpartisan sports media in Trump’s America: The metapolitics of breitbart sports. Communication & Sport. https://doi.org/10.1177/2167479518801557. Ferrier, M. (2018, November 29). Christopher Wylie: ‘The fashion industry was crucial to the election of Donald Trump’. Retrieved from https://www.theguardian.com/fashion/2018/nov/29/christopher-wylie-the-fashion-industry-was-crucial-to-the-election-of-donald-trump. Fraser, N. (2017). From progressive Neoliberalism to Trump—And beyond. American Affairs, 1(4). Retrieved from https://americanaffairsjournal.org/2017/11/progressive-neoliberalism-trump-beyond/. Garber, M. (2017). The perils of meritocracy. The Atlantic. Retrieved from https://www.theatlantic.com/entertainment/archive/2017/06/the-perils-of-meritocracy/532215/. Graham, B. A. (2017). Donald Trump has just started on his aim to be the only game in town. The Guardian. Retrieved from https://www.theguardian.com/sport/blog/2017/dec/30/donald-trump-us-sport-nfl-basketball-winter-olympics-president. Harper, J. (2018, January 17). Trump earns his highest approval rating among NASCAR fans, poll finds. Retrieved from https://www.washingtontimes.com/news/2018/jan/17/trump-earns-his-highest-approval-rating-among-nasc/. Healy, P. (2016, March 3). ‘Hut 1! Hut 2!’ Donald Trump credits Tom Brady for Massachusetts score. Retrieved from https://www.nytimes.com/politics/first-draft/2016/03/03/hut-1-hut-2-donald-trump-credits-tom-brady-for-massachusetts-score/?_r=0. James, L. (2016, October 2). LeBron James: Why I’m endorsing Hillary Clinton. Businessinsider.com. Retrieved from https://www.businessinsider.com/lebron-james-why-endorsing-hillary-clinton-for-president-2016-9. King, B. (2018). Trump, celebrity and the merchant imaginary. Palgrave Communications, 4, 130. Retrieved from https://www.nature.com/articles/s41599-018-0177-6. Kobach, K. W. (2017). Kobach: Why taking a knee during the national anthem is not only unpatriotic, its ignorant. Breitbart.com. Retrieved from https://www.breitbart.com/politics/2017/09/25/kobach-why-taking-a-knee-during-the-national-anthem-is-not-only-unpatriotic-its-ignorant/. Madkour, A. D. (2017). A controversial choice, but Trump’s influence is undeniable. Street & Smith’s Sports Business Journal. Retrieved from https://www.sportsbusinessdaily.com/Journal/Issues/2017/12/11/Most-Influential/1.aspx. McCain, J., & Flake, J. (2015). Tackling paid patriotsm: A joint oversight report. Retrieved from https://www.mccain.senate.gov/public/_cache/files/12de6dcb-d8d8-4a58-8795-562297f948c1/tackling-paid-patriotism-oversight-report.pdf. McRae, D. (2017, December 8). Kareem Abdul-Jabbar: ‘Trump is where he is because of his appeal to racism’. Retrieved from https://www.theguardian.com/sport/2017/dec/08/kareem-abdul-jabbar-kaepernick-trump-interview. Moore, A. J., & Dewberry, D. (2012). The Masculine image of presidents as sporting figures. SAGE Open. https://doi.org/10.1177/2158244012457078. Mudde, C. (2018). Why is Trump still so popular? He gives his base what they want. The Guardian. Retrieved from https://www.theguardian.com/commentisfree/2018/jun/29/trump-popular-base-cas-mudde. Nakamura, D. (2017). For Trump, fighting with athletes is political sport. The Washington Post. Retrieved from https://www.washingtonpost.com/politics/for-trump-fighting-with-athletes-is-political-sport/2017/11/20/6b862fbe-ce13-11e7-a1a3-0d1e45a6de3d_story.html?noredirect=on&utm_term=.b1200515dfb1. Rovell, D. (2018, January 26). Vince McMahon: XFL to return in 2020 without gimmicks. Retrieved from http://www.espn.com/nfl/story/_/id/22213241/vince-mcmahon-gimmick-free-xfl-return-2020. Roy, A. (2016). Divesting from whiteness: The university in the age of Trumpism. Society and Space. Retrieved from http://societyandspace.org/2016/11/28/divesting-from-whiteness-the-university-in-the-age-of-trumpism/. Trump, D. (2016, January 11). “NFL football has become soft”. The Guardian. Retrieved from https://www.theguardian.com/us-news/video/2016/jan/11/donald-trump-nfl-football-soft-video. Trump, D. (2018). Remarks by President Trump in state of the union address. whitehouse.gov. Retrieved from https://www.whitehouse.gov/briefings-statements/remarks-president-trump-state-union-address/. Wagoner, N. (2016a, October 16). Bills fans boo Colin Kaepernick, chant ‘USA’ before he kneels. ESPN.com. Retrieved from http://www.espn.com/nfl/story/_/id/17807180/buffalo-bills-fans-chant-usa-coin-kaepernick-san-francisco-49ers-kneels. Wagoner, N. (2016b, October 17). Transcript of Colin Kaepernick’s comments about sitting during national anthem. ESPN.com. Retrieved from http://www.espn.com/blog/nflnation/post/_/id/212012/transcript-of-colin-kaepernicks-comments-about-sitting-during-national-anthem.